Where Philadelphia’s got Soul, Pittsburgh’s got Power. The Arena Football League (AFL) has arrived. 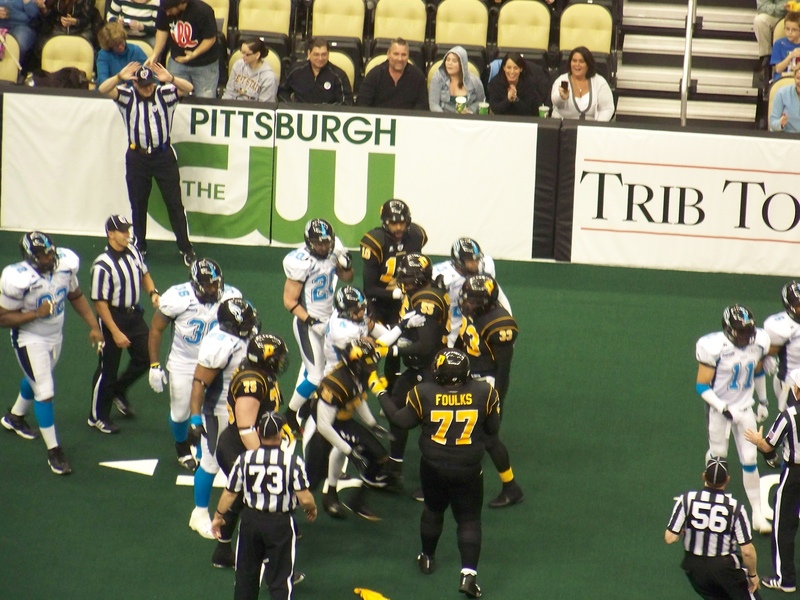 Consol Energy Center kicked off the first AFL game, featuring a newly formed Pennsylvania rivalry on March 12. The Pittsburgh Power put up a strong fight but the team’s efforts fell short in overtime, with a final score of 58-52 Philadelphia Soul. With only four minutes to go, Philadelphia led Pittsburgh 52-42. By the two minute warning, many of the fans had given up hope, but not the Power. By the time the clock reached the final minute of the game, the Power scored, bringing them just three points short of a tie. The Power went for an onside kick, only to have the Soul repossess the ball. At this point all hope seemed to be lost. I assumed the Soul would just take a knee and that would be the end of it, but the Power had remaining timeouts which forced the Soul to play out the four downs. And, miraculously, the Power regained control of the ball. As fans returned to their seats, Pittsburgh attempted two incomplete passes aimed for the end zone. Eventually, the Power reached field goal range, with a whopping three seconds to go on the clock – they scored. If nothing else, arena football proved to be full of constant action, up to the final second of regulation game play. Unfortunately, the Power did not score during their possession; in fact, the Soul intercepted and scored, effectively ending the game. Even though the Power lost their opening game, the overall experience and atmosphere was energizing, yet irksome. While the game was entertaining, it seemed like whoever organized the event didn’t plan it out very well. Videography was choppy, Will Call was a mess, and we didn’t even find out there were programs until after we were seated in this crowded area, elbow-to-elbow. The Power’s dance team, affectionately named the Sparks, showed adequate entertainment unintentionally when one face planted during their first run onto the field in between plays. Strangely enough, the videographer kept showing the Sparks dancers climbing over the wall to return to their “caged in” area next to the goal posts. During half time, the Sparks did a routine with umbrellas, which I’m still confused about. They threw them to the side after a few minutes and danced around a little more. The laser show being projected across the piping along the ceiling was pointless and did I mention speakers covered the scoreboard at the top of the jumbo-Tron? Talk about unorganized. Decent tickets were too expensive to even consider. For $140, fans could sit in the majority of the lower sections along the sidelines. For $50, fans could sit in the lower sections diagonal to the end zones and for $35, fans could sit behind the end zones in the lower section. All but four sections in the upper deck were general admission, which seemed to be the best bet. For $20 plus fees and taxes, you could pick your own seat, and considering how many were open, you could find a pretty decent one with little trouble. For weeks, Pittsburgh Power has been advertising season tickets for these sporting events, but I’m here to tell you don’t bother spending money on those. It’s fun to attend a game or two on a weekend, but I don’t think this whole arena football thing will be very successful in the city of champions. Although arena football operates under most of the traditional football regulations, some aspects change to accommodate the smaller spaces. The field itself measures only 50 yards and the field goal area is reduced to nine feet wide. There also appear to be no sidelines—that is, players remain in bounds unless they topple over the foam sideboards or are shoved into the wall by opponents. In arena football, there is no punting on the third down; rather, the team must go for it. No exceptions. During overtime, the clock is reset to 15 minutes. Each team has one opportunity for possession. At the end of these two possessions, if one team has scored, there is a victory; if neither team scores, they move on to sudden death overtime. In arena football, only eight members of each team are on the field at a time.